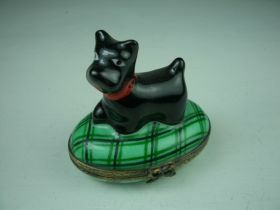 This Black Westie was especially made for Michael's Boxes in a Limited Edition of 50. Inside is a red cushion and underneath are the Limoges markings. We cannot guarantee you which number you may purchase but you can be assured of its uniqueness.